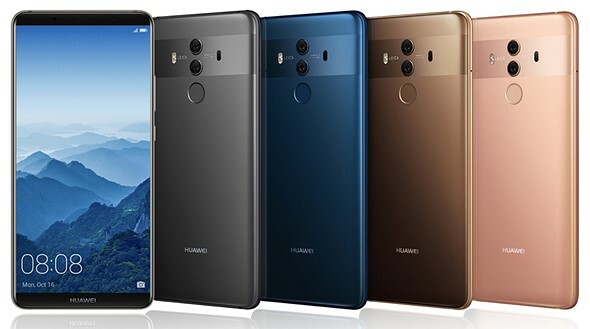 AT&T and Verizon may have pulled out of selling the Huawei Mate 10 Pro in the US—under a little bit of political pressure—but luckily, you can still get your hands on Huawei's latest flagship smartphone and it's well-reviewed "co-engineered with Leica" dual camera. The Chinese manufacturer announced that pre-orders for the unlocked version of the Mate 10 Pro are starting in the US today, in-store and online at electronic retailers including Amazon, BestBuy, Microsoft, Newegg, and B&H. The phone will initially be available in Midnight Blue and Titanium Grey. A Mocha Brown variant will make it to the stores in the near future. In addition, the souped-up Porsche Design version of the Mate 10 Pro will be available online starting February 18th. We spoke to a Huawei spokesperson to confirm, and even though you won't be able to purchase a Mate 10 Pro through a carrier, the unlocked device will operate on GSM networks in the U.S., including: AT&T, T-Mobile, Cricket, MetroPCS, Simple Mobile and Tracfone. As an added bonus, customers that pre-order between now and February 17th will receive a $150 gift card from the retailer from which it was purchased. If you are contemplating replacing your current device, the Huawei Mate 10 Pro is definitely worth a closer look. Its Leica-co-engineered camera performed very well during our testing, and it's a great device is general use as well. The regular Mate 10 Pro in its various colors goes for $800 unlocked, while the special Porsche Design version will retail for $1,225 when it starts shipping in 12 days' time. PLANO, Texas, Feb. 5, 2018 /PRNewswire/ -- Pre-orders for the highly acclaimed HUAWEI Mate 10 Pro will begin on Feb. 5in-stores and online at major electronic retailers including Amazon, BestBuy, Microsoft, Newegg, and B&H. Customers who pre-order the device from now until Feb. 17 will receive a $150 gift card from the retailer in which it was purchased. The HUAWEI Mate 10 Pro will begin shipping Feb. 18. In addition to the HUAWEI Mate 10 Pro, the new Porsche Design HUAWEI Mate 10 will be available online at major retailers, including Best Buy, Amazon, Microsoft, Newegg, and B&H. Retailing for $1,225 starting Feb. 18, the Porsche Design HUAWEI Mate 10 combines luxury aesthetics with cutting-edge mobile engineering and technology. Porsche Design HUAWEI Mate 10 showcases a race track inspired design in a Diamond Black body, and features 6GB of RAM, 256GB of ROM and a customized UI to perfectly complement its premium experience. What can you do with an $800 phone that you can't with a $200 phone? I want a convincing list. We're Huwawei, your trusted partner in technology piracy. What would you like to pirate today? @Mike - pirated from whom? @Mike - it's your example. What's your point? No. Donald Trump did not want 5G nationalized. A White House staffer proposed that. He has been fired. Why don't you do your own fact checking? Just before P11/P20 ships next month and advances on the Mate 10 Pro in photographic front. Speed is of the essence on the mobile market... US carriers are dog slow. The prices are going quite insane nowadays. I have the Mate 9,...and I'm impressed with its speed, screen size, and 4k mah battery! I paid just $459. There is no way I'd give anyone $800 for a freak'n phone! I love Mate 9, too. The only cons I found is that it's not water proof. Otherwise, it's all I need. Yes! And the "Fingerprint" reader is crazy fast,....suppose to be the fastest fingerprint reader on the smartphone market! Does it have Micro sd? $800 for an unlocked, 128GB phone is pretty good deal. Despite it not being supported on Verizon though, which is the only good service where I'm at. But I just got a new phone so no new phones for at least a few years for me. After my current phone becomes obsolete (in 3-4 years) I'll probably just go back to buying used phones for those who have to have the latest and greatest, and take advantage of their tech habits of having to have the latest devices. Sort of like how I buy cars. I'll buy a 2-3 year old car and let some other person lose all the money they put into it, on most of the depreciation. Yes there's the risk in both instances of getting a lemon, but that's less and less these days in my opinion. At least as far as cars go, if you know what you look for (in terms of problems and doing your research--including the car's history) you should be able to avoid buying a dud. Huawie seems to be competing with Apple on whose prices goe higher. I guess I'll stick with the Huawie Honor 8 for a while. Not paying $800 for a phone. I really like the Honor 8, its octa-core, and its dual camera. I have had it for over a year now, and so far it has been awesome, after Huawie replaced the original one during the first month. The original was destroyed by excessive heat due to a push of a Beta version of Android 7, and firmware / EMUI 5 (pushed by Android). I'm happy with EMUI 4.1 and Android 6. Huawie's service during the replacement process was excellent, and very fast with overnight shipping. Honor 8 here too... happy as well.. Black Friday pick-up for less than $300... can't imagine spending close to $1000 for a freaking phone... even if I do use it all day long! Mine was for $0, as in free, aside from writing a relatively short technical article. I was under the impression that Verizon had added GSM to their network. The article says AT&T and Verizon had ..., etc. So it sounds like Verizon was planning on getting it. Verizon didn't add GSM, but some phones add extra CDMA antennas to support every carrier. Why isn't this pronounced Hawaii?? Maybe it is the Chinese pronunciation of Hawaii. Although Westerners often pronounce the name like “hoo-ah-way,” the correct pronunciation is more like “whah - way”: two syllables, not three. Is it a good phone? I'm sure it is. But I personally decided that paying that sort of money for a small portable device not worth it for me. I can get 90% of quality and features for 20% of the price and that's a much better value proposition for me. You mean there are people out there who actually buy expensive phones for the camera feature? Imagine that. Why? Did you look at the Leica sample galleries? Probably the worst JPEG of any major camera company. That said JPEG engines on phones need to be different anyway, because they are targeted at a different user group and a different presentation method. Actually no, I didn't look at the lecia galleries - so you have me there. @panther fan, I opted to use a USB OTG as card reader and my Nikon coolpix A. My phone runs a Qualcomm 615 which struggles a bit with the Nikon's 16MP raw files but works quite happily with jpegs run through snapseed. For now, that suits me. The phone is still the device I have most often. To be fair, today’s “phones” are really pocket computers, capable of a lot more than just making phone calls. In fact, I use my “phone” a LOT more on the Internet and taking photos / videos then I do making phone calls! When they were really just phones, they were free with service. I'm sort of where JohnP is: Of course I get that a smartphone is not just a phone. And I love that I can be with friends, and can immediately Google the answer to whatever trivia question we're thinking of. But I get that (plus a crappy camera) in my $70 smartphone. For 200, I can get a pretty-good-but-not-great camera. It's the extra $600 (or 800 more, and soon to be 1,300 more, I am confident). Upon reflection, I guess my shock (horror??) is that it's a crazy-high price, AND, it's for technology that will, almost be definition, by antiquated in a few years. I think a big reason why so many of us feel that way is because these are just minor improvements to an existing and available technology. Had it been something as ground breaking as original touchscreen iPhone when Motorola flip phones ruled the market, then yes - I could see the new device commanding a higher price tag. Even then - iPhone debuted in 2007 at $499. In a sense, what we are seeing with iPhoneX and similar devices has happened to film cameras. These are the equivalent of high end film cameras that were pushing the limits of exhibiting technology, but still crumbled when digital cameras with their (initially) low resolution, poor low light performance and low quality lenses made the entry and eventually gained dominance. It doesn't mater how great those top end film cameras of late 90's where, some of them still outperform digital in some regards, but people are not buying them any more because they are more of a museum piece than something most want to use. To repeat the point of several others here. $800 isn't THAT bad when you look at the capabilities of modern flagships and all the devices they have replaced. If your on a tight budget(or cheap) you have options. You can get a previous generation flagship and get most of the performance for less money. Most of the budget models I avoid because they don't even match several generation old flagship models. We are also on a photo enthusiasts website where many users don't even bat an eye at $1000 bodies and lenses. Just is what it is. My only problem is that 5 years ago we were justifying $500-600 as "not that bad". Then it was $700, then $800. Now this $800 phone is actually considered "cheap" compared to Apple and Samsung's comparable models. Meanwhile, every other computing device stays the same price or cheaper as tech improves. If they could charge two grand for a phone and get away with it they absolutely would. AT&T and Verizon may have pulled out of selling the Huawei Mate 10 Pro in the US—under a little bit of POLITICAL PRESSURE ... ? From whom? Thanks for the links. Now I get it. I have a suspicion that Apple persuaded some members of Congress to nix ATT and Verizon using Huawei. Tim Cook was smooching with Trump and Congress folks need money donations for the next election. Surprised? Business as usual. @Gonard, following the links I found out Huawei Mate 10 Pro can run on 5G which Donald Trump wanted this band nationalize with the consternation of FCC Chief. On second thought, the administration feels China may embed a technology to listen in on calls and read text messages. Possibly Tim Cook has a hand on this, too, considering their iPhoneX is a flop price-wise causing them to half the production. @chrshale Googled it. Nope, no White House staffer/coffee boy fired for proposing preposterous idea. Talking about "staffer" mainstream liberal media labels Chief-of-Staff Kelly as "staff".